USAH Director of Youth Hockey Kenny Rausch Explains How Making Mistakes is GOOD. 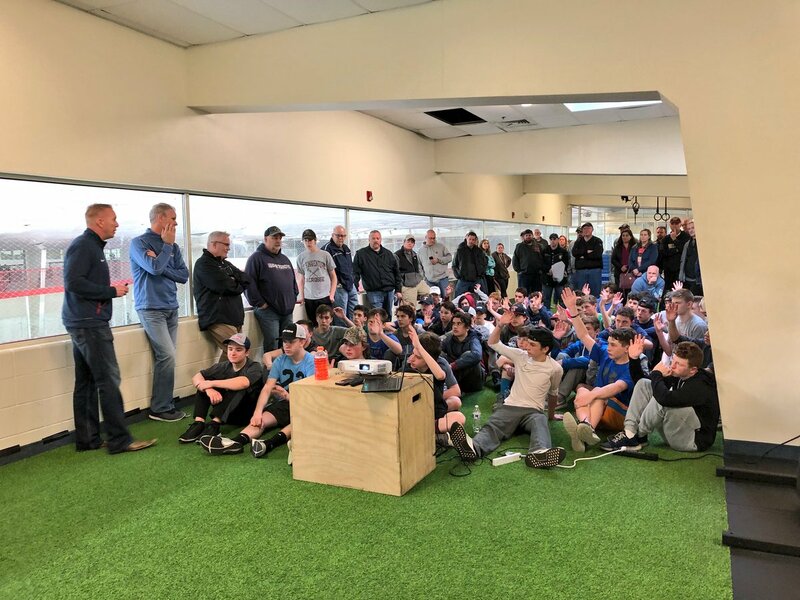 USAH Director of Youth Hockey Kenny Rausch speaks to hockey families in Massachusetts. Earlier this month, 23-year-old New York Rangers defenseman Neal Pionk took a puck from behind his own net and, with pressure bearing down on him, whipped up a spin-o-rama within a few feet of his own net in a 3-3 tie game. The clip went viral, of course, leading to what could have been a referendum on what constitutes a mistake in hockey these days. In the eyes of Kenny Rausch, the former Boston University standout and current Director of Youth Hockey at USA Hockey, this was no mistake, and he let the Twitter world know. Rausch is part of a vanguard movement to not only embrace mistakes, but also to encourage them. In his worldview, along with a growing number of others, outscoring mistakes is a whole lot more enjoyable – and important to player development – than eliminating them. A 2-1 win is not Rausch’s cup of tea. No, he’d like to score seven. In fact, he’s set that as the goal for his high school team. And if the other team scores eight, so be it. Still, making mistakes isn’t always fun for players. Mistakes can sting. Mistakes can lead to players putting unnecessary pressure on themselves. According to Rausch, it really doesn’t have to be the case, and he has an interesting turning of the tables for a player who commits a mistake that ends up in the back of his goaltender’s net. Rausch hasn’t necessarily always preached such freewheeling hockey. And he understands there are coaches who are thinking about wins and losses. He just doesn’t buy that players are best served by looking to grind out that 2-1 win with safe hockey. Rausch credits longtime friend and Babson head coach Jamie Rice for helping his own evolution, along with Bliss Littler, now with the Wenatchee Wild and the one who shared with Rausch the idea of coaching his players to outscore the mistakes. Coaches can help their players take steps toward that development by not punishing mistakes or the experiments that might have led to mistakes. That may mean more small-area games where decisions and puck movements have to be quicker, including the under-handling of the puck. Under-handling the puck and moving it quickly isn’t easy, either, and it likely will take players some trial and error to get it right. Small-area games set that stage. Ultimately, the more a player can learn through making mistakes all over the ice, the better for his or her development. But when is it time to start coming down a bit harder on player mistakes? When should a coach start talking about making sure his or her players are playing it safe? And if you find yourself coming out of your own zone and pressure is bearing down on you, give a spin-o-rama a try. Just think, if Neal Pionk was trying his first spin-o-rama in a tied NHL game at the age of 23, that might have been an entirely different and much more unfortunate mistake.